It's just about a love of bikes. Riding, building and playing with them. 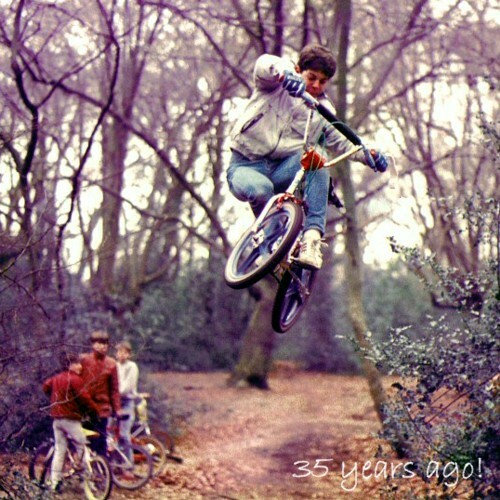 From trackers* in the late 70's, through BMX in the early 80's and all sorts of mountain bikes beyond. Having gone full circle, the focus is now on simple singlespeed and fixed wheel bikes, on and off-road. Tarmac, track, mountain. At VeloSolo we distribute our own range of UK made precision bike components including drilled disc hub mount and standard threaded cogs as well as chainrings, handlebars, tools and associated components. All UK manufactured and designed from start to finish - solid cro-mo steel bar and various aluminium alloy stock into the machine shop one end, finished components out the other. The disc mount system is about bringing an alternative to the traditional screw on fixed wheel cog for all cyclists - urban riders in the city, tourers on the open road or mountain bikers who want a simple way to try fixed wheel riding off-road. In addition we retail an always growing range of fixed wheel and singlespeed products from other companies including Token, Sugino, MKS, Miche, Nitto, KMC, DID, Suzue, Dia Compe, Onza, Selle Italia, Andel, SR, Stronglight, FSA, Pedro's, Izumi, Zenith, Kalloy, Velo, Shimano, Tange, VP, Cionlli, BBB, Hozan, Oury, Cinelli, Gebhardt, Deda, Velox etc. Established in 2007, we are based in the south of England and ship worldwide every day with customers in over 60 countries and across the USA. Thinking of buying at VeloSolo? It is not an idle boast that we pride ourselves on the very highest levels of service and back-up. Please check our feedback as ebay sellers or see below for customer testimonials or more reviews from customers here:Trustpilot VeloSolo reviews. Whatever your reasons for visiting the VeloSolo website we hope to offer a wealth of information and helpful service. All products have clear and honest descriptions together with numerous large clear photographs so you can see exactly what you are buying. We're fussy so and so's and do not sell anything we would not happily use on our own bikes. If you are new to singlespeed and fixed please be sure to check the faq for lots of helpful info. If you have any questions please do not hesitate to email. We endeavour to offer the very best service possible, below are some recent emailed comments from both UK and International customers: (our eBay feedback is here). Adam (New Zealand). Just want to say thanks for your chainring and bolts! I didn’t know where to place good feedback, so thought I’d email you. Product looks of excellent quality and rides smooth as silk, couldn’t be happier. Great service and top notch product. Danny (Cheshire, UK). Thank you for keeping me informed. The chain arrived safely today. Excellent service, keep up the good work. Richard (Towcester, UK). I’ve been using you for a few years now and your products and customer service are always excellent. Justin (Essex, UK). Fantastic service from you as always, got my freewheel today. Antonio (Milan, Italy). I want to inform you the item I purchase from your website has arrived! Thank you so much! I've just installed the cog on my new bike, and is just amazing! Thank you again. John (Norfolk, UK). Thanks once again for your service and for keeping me updated with progress. The chainset looks great and will soon be on the road. Andrew (Dorset, UK). Thank you for the superb 38t 1/8 chainring, received today. It's destined for a hub geared 1953 Viking lightweight I'm riding from home to Stratford upon Avon. A solo charity ride. My 46t steel chainset was just too high geared and rather ugly! Yours now looks far too smart for the frame. Juris (Riga, Latvia). All went good and fast! Thank you and greetings from Riga! Roger (Essex, UK). Just received goods. All in order and now I have something to do for the rest of the day. Great service and an excellent informative chatty style website. Already spreading the word. Keep up the good work. Carleton (GA, USA). I just received the wrench. It’s very nice. I’ll be happy to show my friends. Steve (West Sussex, UK). Thank you very much - prompt service as ever! Mark (Birmingham, UK). I have taken delivery - seat post is spot on! Many thanks. Pete (Bristol, UK). The fact that you rarely hear from me is entirely testament to the high quality stuff you’ve sold me over thee years. I always check your site first if I ever need stuff. My Argos is a good example. This got daily 22 mile usage for 3 years. 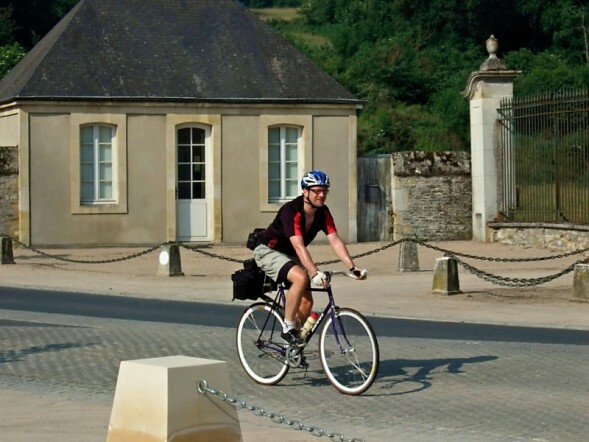 Took me on two Normandy holidays and yet your rear hub received no maintenance 'til last year. Chris (UK). Many thanks for my order of the Zenith Threadless BB and BB tool. I have fitted the BB to my vintage Viscount which was very easy to do and have just done my first test ride after the basic restoration work. All went well and the bike feels great. Many thanks. James (UK). Just a quick note to say thank you for the quick turnaround and postage adjustment. I have been enjoying the increased top speed. Mark (Northumberland, UK). Thanks for the prompt dispatch of my order. I have installed it and is working well. Callum (Glasgow, UK). Thanks for highlighting my error - very rare to get service like that when you could have so easily posted both out and made more money! Your website is also extremely helpful so you have my thanks. Paul (West Sussex, UK). Thanks you so much for great customer service and product. It's been a joy dealing with you and enjoying your website. Will (Hampshire, UK). My order arrived safely this morning. This is my second time buying spacers from VeloSolo, and they are well worth waiting for. Robert (Avon, UK). Very happy with the service provided by you and your product. 100% happy many thanks. Trevor (AZ, USA). I just installed the spacer & lock-ring – looks great! I love the flexibility of being able to move the chainring around to get the chain perfectly straight. Thanks. Jon (Durham, UK). Just to confirm I have all my items. Great service and great products. I have no doubt I will be back ordering in due course (Nice leverage on the chain whip - I don't need the old bit of metal bar I normally use. Basil (Dublin, Ireland). Just wanted to say that everything arrived on time and I'm delighted with all the parts, thanks again! Rusdy (WA, Australia). I wish I've found you guys earlier. Being a first timer trying to convert my mountain bike frame to a fixie, so many things I haven't considered before, especially chain line problem. Relying my usual shop (Wiggle) to supply the kit didn't solve my problem. Long story cut short, your 5 bolt crank arm, cassette spacer, and chain tensioner is the perfect solution for my problem. Not to mention it now looks cool! Satisfied customer. Robert (Germany). Usually I am reluctant commenting on online purchases. But your product is fantastic. Getting the chainline right and installing the Bolt on Cog went smoothly. The result is astonishing. I am now riding a pink Specialized Hard Rock MTB from the early nineties fixed. Winter can come. Keep up the good work! Trevor (Glasgow, UK). Always a quality service from Velo Solo. Been away from fixed gear for a couple of years and looking forward to getting back. Joe (Pembrokeshire, UK). Just wanted to drop a note to you to say thanks for getting the chainwheel out to me so quickly. I was looking for the best singlespeed chainring on the market for one of my customer's bikes and I was very impressed with the finish quality and also how smoothly it runs. It loks like it will be durable as well, but likely that'll take quite a while to fully appreciate! Ian (Glasgow, UK). Just a quick note to let you know I received this stuff today, thanks again for the quick delivery. All the best to all at VeloSolo, nice doing business with you again. Max (Munich, Germany). Package was delivered today, thanks, really awesome and fast shipping. Simon (Hertfordshire, UK). Chainring just arrived. Thanks for everything - Spot on service. Phillip (Berkshire, UK). Received yesterday. That's an excellent service, thanks! Alec (Greater Manchester, UK). Just wanted to mention a couple of things...firstly, when you sent me an acknowledgement of my order, you put your name on it. This was so much more friendly than the usual "...The Sales Team..." or "Sales Department". Secondly, my stuff arrived on Wednesday - which was the day after I ordered it. You can't really fault that at all. I'm about to start building myself a new singlespeed from the frame up, so I'll obviously be needing some more stuff for it. You can expect at least one more order from me. Ian (Chester, UK). Received today - to fit tomorrow - and very nice it is too! Many thanks for your help. Alex (London, UK). I have used your shop a number of times and have always been happy. I must say the chainrings are particularly nice and I can't wait to get it on my bike. Roger (UK). Many thanks. Very pleased with the Zenith stem. Promptly despatched and delivered, and well packaged. I’ll be back. Andrew (West Sussex, UK). Have built the bike up over the weekend - runs perfectly, very pleased so thanks very much for your guidance! Gordon (Skelmorlie, UK). Fitted chainring last night along with new chain and freewheel. Fits perfect and works a treat. Auke (Utrecht, Netherlands). Your cog arrived and it's a nice piece of work. After installing my setup runs buttery smooth again, so thank you! Steve (Nottinghamshire, UK). Received this morning, such fantastic service. Stewart (Yorkshire, UK). I just wanted to thank you again for the great service - the parts arrived safely and look great. I will be back for more parts soon. Tom (Edinburgh, UK). Delighted to say I've received the chain ring. It looks and feels like a lovely piece of kit. I will be using VeloSolo again. I would like to thank you for the personal touch, great service! Greg (Hargroves Cycles, UK). Hi Guys. I have been riding your 48t chain ring for over a year now on my main hack. It still looks like new with 6000+ miles through it. I cannot speak highly enough about it. Thanks for your time. Simon (Bristol, UK). Thank you for all the bits – the bike looks superb with all of these in place. I am really pleased with how quietly this now runs – silent! Steve (Dorset, UK). VeloSolo is one of my favourite bike shops and I am sure I will shop with you again soon. Pete (Somerset, UK). Many thanks as usual. Great range of products as always. My 165mm Lascos are still doing sterling service on permanent loan (ie pinched) on my mates fixie. You've seen me through every bike I've owned since you were London Fixie Bike. The new 170mm Lascos will proudly go on my new Moulton kit bike. Best regards. Phil (West Sussex, UK). I’ve been using your chainrings for a few years now, so can tell you what I think already. I run one 1 x on all my bikes and your ‘rings are on all but one of them. They’re great, good quality, stiff, last ages and they’re much better priced than most of your rivals. I used Thorn’s single rings before I found you, mechanically they were pretty good too, but they don’t fit on the cranks as well so were a bit of an asthetic mess and they’re not made in the UK. Barry (Middlesex, UK). I have just received my stem. Exemplary service as usual. Erland (Highland, UK). Got the parts! I really like your stuff and your website, so will be telling my friends. Thanks. Nick (Hertfordshire, UK). Thanks for the "heads up" on my chainring. I've used you a lot for parts and as always, you offer a really good service. Thanks for sorting. Anthony (North Yorkshire, UK). Quill stem delivered today and it is prefect! Thanks again. James (Alberta, Canada). I really appreciate your help and the great customer service with this, especially the communication. I'm not an avid bike rider at all, but did join a large online bike forum for guidance (they are the ones who suggested I order this long stem vs buying a new bike) and I can see why your Company is always suggested, even from USA based buyers who probably have local options. Ken (Malaysia). Item received yesterday. Thank you very much. Happy with the purchase. Will surely recommend your product to others. Olivier (London, UK). A lot of tool envy from people at Herne Hill Velodrome who've seen and held your track tool. Phil (Lancashire, UK). VeloSolo have really stepped and provided a quality service in my attempts to convert a TT bike to single speed. Will definitely use VeloSolo again and recommend you to mates. Jeff (London, UK). Great looking stem and great service. Alasdair (UK). The grips arrived today and are now on the bike. They complement my new tan saddle a treat. Thanks again for your assistance. Dominic (Essex, UK). The single speed rear cog arrived this morning. It is a seriously beautiful bit of kit and blows the pressed metal ones out of the water. It looks, feels and oozes quality...you just know it will run well once it is fitted. Worth every penny. I'm looking forward to fitting and racing with it over the next few weeks. Thank you for the quick service. Andreas (Denmark). Thanks for the components. I recently finished my project, so I thought you should see how it turned out! The components are really nice! Thanks for the good service, I'm looking forward to buy from you again. Vytenis (Vilnius, Lithuania). Just today received my Combined Chain Whip and Lockring Tool. Looks really good, thanks for fast shipping. Have a nice weekend. Dennis (Ballerup, Denmark). Thanks for a great service once again. Ed (Worcestershire, UK). Thanks for the personal touch/service and attention to detail - generally in a world lacking that now. Makes all the difference. Rachel (London, UK). Much appreciated. I'm really impressed with the other bits I ordered. I've been looking for a stem like the Kalloy for ages and will defo be back on your site in the future. John (Nottinghamshire, UK). I’m really happy with the spanners. [VeloSolo Track Tools] They look good, feel good and are kind to the nuts. Mike (Edinburgh, UK). New chain ring installed and tested. Great piece of kit and beautifully made! Bike now has better teeth than Richard Hammond and is mercifully quieter. Martin (Sjolund, Denmark). Products arrived today. Very swift delivery, as per usual. There's a reason I am a returning costumer. You have always excelled in customer service and great selection in special bike parts. I am still amazed over the XT disc hub I got last year from you that I run on my vintage fixed gear bike with a VeloSolo Disc Cog. I know I'll be pleased with this single speed setup on my Commuter bike. Thanks again. Gavin (Essex, UK). The stem arrived safe and sound this morning. I've fitted it on my bike and it's exactly what I was after. Thanks for keeping me posted with what was happening - great service! Tamas (Vesces, Hungary). The chainring is arrived today.Superb quality - as always.Thanks! Ian (Surrey, UK). Thank you very much for your correspondence, I am very impressed with the products and the communication from yourselves. Due to the service I have received so far I shall be shortly ordering one of the Disc Cogs along with a chainring and eventually some handlebars and other little bits. Yet again, thank you. Graham (Cardiff, UK). Really happy with the bits I've bought from you and these BB spacers have done the job perfectly. The best thing was the convenience of the freehub spacers which have enabled me to re-use an old wheelset to get this bike running as a singlespeed. The chainring is nice too. Cheers! Euan (Angus, UK). Thanks for the excellent service. The parts are just superb and you are right, the spacer rings do polish up nicely. I finally have Project fat tyre singlespeed finished (MTB SS with Campag cranks and 2" slicks) and it goes like a dream. I will definitely be back for more bits in the future. Paul (Berkshire, UK). Hi, items arrived this morning. Very happy with them and with your service. Look forward to buying more 'goodies' in the future! Keith (West Midlands, UK). Just to let you know that the parts I ordered from you arrived safely and promptly. Thank you for an excellent service. The parts are First Class (and already fitted). Your customer service was most impressive and I will certainly recommend your company to friends, colleagues and anyone else interested in bikes. We run a Community Centre in the Midlands and last year we managed to have a BMX Pump Track built on-site. Three of our management team trained up as Bike Instructors and we now do quite a lot of cycle activity now. I would be willing to put a link from our web site for the excellent service that I experienced and received from your company. Ian (Surrey, UK). My goodies arrived this morning. I'm really chuffed with the spanner [track tool]. Thanks. Andrew (Wiltshire, UK). Parts arrived safely this morning. Great service and great products thanks. Francis (West Midlands, UK). Received - excellent stuff, building up a single speed! Would recommend your components and found your Q&A a big help. Again thanks for your help - will send a pic on completion. All the best. James (Surrey, UK). Just wanted to say a big thanks for a great service, just fitted the chainring with no problems and less than 48 hours after ordering it! Thanks again, I'll be back and certainly recommend you guys! Kristoff (Aarhus, Denmark). Order arrived just fine - everything looks good. Looking forward to build my bike! I will use the parts to rebuild an old bike my father used to have when I was a little kid. Now I am making it my own up-to-date ride. Can't wait to get it up and running. Terry (Hampshire, UK). Thanks very much for the 'personal' service. I look forward to receiving everything and putting some colourful bling on my fixie! Trevor (Berkshire, UK). Just a short email to say my stuff arrived & has been fitted. As always - quality products & exceptional service. Looking forward to dealing with you again soon. Gavin (Dublin, Ireland). I just wanted to drop you this quick email to say thank you. The bars arrived this morning which was super fast delivery. They are perfect as described and totally rock my bike. Thanks again, I'll definitely be back to make future purchases. Bart (Oosterlund, Netherlands). Received my order, thanks a lot for the excellent service! Simon (West Midlands, UK). I have received all my items and I just wanted to thank you for your excellent customer services. The products appear of a high standard and I'm looking forward to installing them on my old steel bike. Steve (East Riding of Yorkshire, UK). Just a short note to say thanks for the excellent service. The new 38T chainwheel arrived this morning and will be fitted and working over the weekend – if not before. I’m fitting a new Rohloff to my GT 29er to replace a Sram i-motion 9 hub. Mark (Wiltshire, UK). Just had the delivery and put the hub together - love the kit! Going to build it up with a H Plus Son Foundation Face rim and DT Swiss competition spokes. Should be great! Can't wait - thanks again. Josh (Alaska, USA). I should mention that I've been using one of your 22 teeth cogs now for a few years on my fixed-gear fat bike. It's a super solid product and has served me very well. Keep up the great work! Chris (Dorset, UK). The freewheel arrived today...thanks once again for your brilliant service and the very speedy delivery. Martin (Sjolund Denmark). Products arrived today. Very swift delivery, as per usual. There's a reason I am a returning costumer. You have always excelled in customer service and great selection in special bike parts. I am still amazed over the XT disc hub I got last year from you that I run on my vintage fixed gear bike with a VeloSolo Disc Cog. Martin (Carinthia, Austria). I just wanted to send you a pic from my freshly built bike right on my first test ride. As far as I can say after the first 75km it does a great job and it will prove an many many miles as the build is meant to be my far reach fixed gear endurance thingy. I totally happy with the look and the riding feel and the superb quality of your cog. John (Shropshire, UK). Hello, just to let you know I've just received the second item from you, some MKS pedal flips. I'm so pleased with the quality of the parts and the speed in which I receive them. I will not be going anywhere else for my track parts in the future. Well done VeloSolo. All the best, John, a very happy customer. Joe (Gloucestershire, UK). Many thanks for the parts, really great quality and superb service. Alan (Stirling, UK). Just received crescent handlebars first thing today. First class service. Bought this for my wife's folder. What a difference. Being small she was stretching with original flatbar, so this clever well made product has taken strain off her wrists. Also no clearance issues with 15t bolt on cog that I purchased recently. Another well made product. Nice to see a company that supplies well made products. Wishing you every success in the future. John (Manchester, UK). All the gear arrived today, very impressed with the service and the items, those straps are class and will definitely recommend to my buddies, keep up the good work. Igor (Brazil). Hi there! The "thank you" note is really thoughtful, but I'm the one who should thank you for helping me. Everything is really high quality, just as I expected. Can't wait to assemble them in my bike. Keep up the good work and happy riding! Nigel (Doncaster, UK). Stem arrived today. Looks great and fits perfect. Very pleased. Many Thanks. Samuel (Devon, UK). Your service has been exceptional and really customer focused, I'll be using your site more in the future. I'll definately be recommending it in the club forum. Keith (Essex, UK). Thanks very much for the very quick delivery (just waited nearly 3 weeks for a headset from another supplier!) and an excellent quality product, looks great on the bike, happy days! Paul (London, UK). As usual great prompt service. This is the second crankset I have purchased and the first is still churning away. Thanks for supplying great products. Steve (Cheshire, UK). Thanks for the personal email, it's great to not get the auto machine email when purchasing items. As you are aware this is another purchase from you, I have been using the others, a SS cog and spacers quite a lot recently and they are fantastic pieces of equipment. They have made cycling a completely different experience, they are on my hard tail MTB and I now relax much more on flat ground and have got much fitter by being made to work grader up the hills. Hence why I now need the smaller cog! Thanks again for the good service and great equipment. Duncan (Napier, New Zealand). Your well packaged single speed chainring plus the chainring bolts were delivered to me here in New Zealand late last week in perfect condition - cheers for the fast service and very fast shipping. The chainring has been fitted along with a new rear cog and chain and everything works well and looks the part. Steve (Cumbria, UK). Stem arrived yesterday, very nice piece of kit, and is fitted - a transformation of front end! Michael (UK). Bought a few bits off you recently and just wanted to say how pleased I am. Top quality stuff and great service! You are my number one go to now for spares. Many thanks. Migeul (Vizcaya, Spain). I've received my goods, everything has arrived in perfect condition. Good quality products and a helpful customer service. 100% positive. Johnathan (Dorset, UK). I just wanted to thank you for the prompt delivery of my pedals. They look even better than the pictures and should look fantastic on my re-builds. Jean-Baptiste (Lyon, France). Thanks for every information during my order, I received it. I approve your work (I commend you). David (Highland, UK). Just to let you know the skewers arrived promptly this morning and I'm very happy with them. I'll make sure sure to leave some great feedback. Jim (Cardiff, UK). Parcel arrived yesterday, about 20 hours after placing the order. Great service as always. Thanks. Gavin (Worcestershire, UK). Just to let you know that I received the order - probably the quickest receipt of an internet order from anywhere ever - ace! Julian (North Yorkshire, UK). Thanks for the order, extremely good value, a brilliant site and great service. Very happy! Will definitely be using again! Shivaan (Ontario, Canada). Just wanted to give a big thanks for the delivery which arrived safe and sound. The wrap job on everything was top class! Also, wow, the VeloSolo chainring is even nicer in person! Can't wait to get everything onto the bike this week. Will definitely be doing future orders through VeloSolo, and recommending to friends. John (Cornwall, UK). Thanks for my order and for the [shipping] refund. I love the bits. 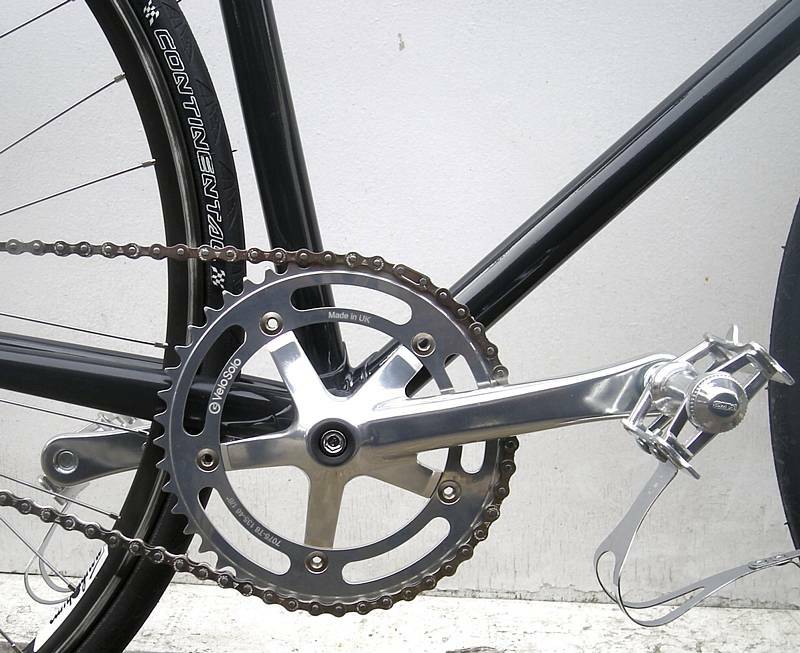 Both chainring and cog are exceptional and look and ride beautifully on their respective bikes. I’ll be back! Pete (Wiltshire, UK). All the parts look to be top-notch and I’m all set now to give the bike a major service during half-term week. So the FAQs on your site are a great source of information. Once again, thanks. Will have no hesitation ordering from you next time. Ian (Oxfordshire, UK). I received my first order yesterday, less than 24 hrs after ordering. Excellent, as are the products all nice and shiny on my new wheel. I followed your advice and went for an MTB wheel but decided to have a bash at building one, so not only do I now have a fixed gear bike but I can also add wheel building to my skills. Thanks again for the advice and the great products. No doubt I'll be back for more. Dean (East Yorkshire, UK). Recently bought a brake calliper from you and I just wanted to say thanks for a great service. I got an email soon after thanking me and letting me know it had been posted and when it arrived today (super quickly) the packing slip was signed with a cheery 'many thanks Dean'. It's fantastic to get such an amazing and personal service (very rare these days). These little touches make a difference and I'll certainly use you again. Martein (Dirksland, Nederlands). Really pleased with all the parts/quality. Will put the bike together this weekend now. Thanks again for your service! Adam (Portsmouth, UK). Hi, I just want to say that I am very impressed with your company in a whole. The site is easy to navigate, the goods are top quality, delivery is especially quick and communication brilliant! Well done VeloSolo! Fran (Northamptonshire, UK). Hi, received everything this morning and all fits perfect. Many thanks for your help and I love the 'Dérailleur - Nein Danke' stuff! Jim (Dallas, USA). Thank you very much for all the communication. Your service is the best I have encountered with any bike shop. Rob (Arizona, USA). Just a quick update to say thank you for the service and help relating to this order which arrived in Arizona five days after you dispatched it. Andy (Hertfordshire, UK). Very pleased with the stem, perfect for my retro build, lightening quick! Kevin (Illinois, USA). I purchased a bolt-on cog this year in hope that it would make my riding experience better. Well, after a little over four months of riding with my new drivetrain I'm pleased to tell you I have never been happier with any other drive chain I've had. My purchase of buying a bolt-on cog came from the stripping of two track hubs. I'm quite sure the stripping came from my gear ratio being so low, almost 1:1 because I play competitive bike polo. The threads of my cheap hubs couldn't hold up. I was hesitant at first and even considered getting a cog and drill pressing the holes in myself but I decided to give VeloSolo a try. I got the 7075-T6 Disc Cog - my cog shows no wear other than some scuff where the cog meets the chain. I ride my bike hard and I can't even imagine the stresses that go on the cog as I play polo with lots of hard jarring skids and direction changes. I want to say thank you to VeloSolo, I'm a very happy customer. I love playing bike polo and I love that VeloSolo had made my playing so much better and enjoyable. Phil (Staffordshire, UK). My order arrived from VeloSolo today, just letting you know in my opinion the spacers etc are quality and look fantastic, another singlespeed convert I think. Ian (Hertfordshire, UK). I have just received one of your CNC Singlespeed MTB chain rings and would like to congratulate you on producing a fantastic product. It was almost too good to fit! Thank you. Colin (Rhyl, N. Wales). Just to thank you for the prompt delivery of the Disc Cog. Although a keen cyclist for many years, this is my first foray into the world of fixed wheel and I am currently building my own fixie. Your website has been an invaluable source of advice - thank you. David (New South Wales, Australia). I received the items yesterday, in record time, all nicely packaged. Thanks again for your great service. Marc (Worcestershire, UK). After being neglected for 20 years my late Uncle's bike is back on the road. I wish that you stocked everything that I needed, as you guys are by far the best. Great customer service, phenomenal shipping and top notch quality products. Andras (Budapest, Hungary). I got the package today. I was absolutely surprised that the delivery so fast. I'm truly satisfied with the high quality and not least lightweight parts. Many thanks for the opportunity and keep up the good work! Pontus (Stockholm, Sweden). Thank you for being awesome! I got my package to Sweden in two workdays and everything was in order. Keep up the good work and I'll definitely visit your shop again soon! Andy (Shropshire, UK). Just a note to say "thank you" for such superb service from VeloSolo. Mine was only a very small order, but it was dealt with very efficiently. Why can't all companies be like this? Kari (Joensuu, Finland). Hi, I received the order yesterday. I just want to thank you for another perfect and super fast delivery. Looking forward to the next order. Greetings from Eastern Finland. Wieger (AC Kortenhoef, Netherlands). Thats what I call 'customer excellence'. Ordered yesterday, and brought by the mail today at 13.30 PM, with compliments from your Royal Mail. Early enough to attach some of the beautiful parts to my singlespeed to be. Thank you so much, can't take my eyes off the spacer kit, almost a work of art. David (Norfolk, UK). Thanks for your excellent service. Your website is nice and easy to access, your products excellent and the jiffy bag my sprocket arrived in looked as though someone had ironed it, how do you do that? Mika (Espoo, Finland). Ordered last year some basic singlespeed road bike stuff, and for the first time went for true SS 1/8" chainwheel, freewheel and chain. The difference between my ealier 20 or so cheap singlespeed bikes that I've built for friends was obvious. Purpose built parts with wide cogs and chain just runs so smoothly and totally quietly. After first 3000 km of work commuting on my ss-converted 1986 Nishiki Road Master (often in crappy Finnish weather with water, slush and gravel) there's no visible wear anywhere. Great stuff! Mike (Angus, UK). Just thought I'd let you know I received my order today, totally delighted with the items, the service, the postage and everything to do with Velosolo. I'll definitely be using and recommending you to everybody and anybody. Juan (Bristol, UK). Just wanted to say thanks for the super fast delivery, the BB and stem are already on their respective bikes, pretty much only 24 hrs after you received my order. Looking forward to doing business with you again! Graham (Manchester, UK). I think your products are fantastic - just the right balance of 'good engineering' and 'cool'. I have a small sideline building up SS'ers for work colleagues and they always include some of your gear, even if its just a cog and some spacers. Mike (Nottinghamshire, UK). Thanks very much - it is a pleasure dealing with yourselves. Fantastic level of info and products combined with a great service. Damon (Southampton, UK). I rode in to work this morning on my new build now fitted with the new Onza double cage pedals with the MKS deep toe clips. Amazing things. There is so much support and they're so large that when I'm stomping up a hill its like I'm climbing stairs, and they look great. I'm very happy. Richard (Manchester, UK). Appreciate the speedy response, packing and despatch. Once again, great service from you guys. Bob (Berkshire, UK). Many thanks for the quick response, chain whip arrived today very nice, looks strong and should last. Less than 24 hrs after the order was placed! Magnus (Møre og Romsdal, Norway). I just want to thank you for a quick, safe and efficient delivery. I ordered Saturday and it arrived Thursday, impressive! Sophie (West Yorkshire, UK). Many thanks for my exciting delivery today - the bars look ace! Really quick delivery, cannot wait to add them to my bike. Great service. Doug (Kent, UK). Hi, just to let you know I just got the stuff I ordered, thanks for the speedy response. This is the second time I've ordered from your website and I'm very pleased with the service. Steven (Saint-Gilles-Croix-de-Vie, France). I would just like to say thanks for the excellent service. I placed my order (via your website) on Sunday and received the goods on Friday. Not bad when you consider I live in France. Everything arrived as ordered and the red anodized spacers look fantastic. Miguel (London, UK). 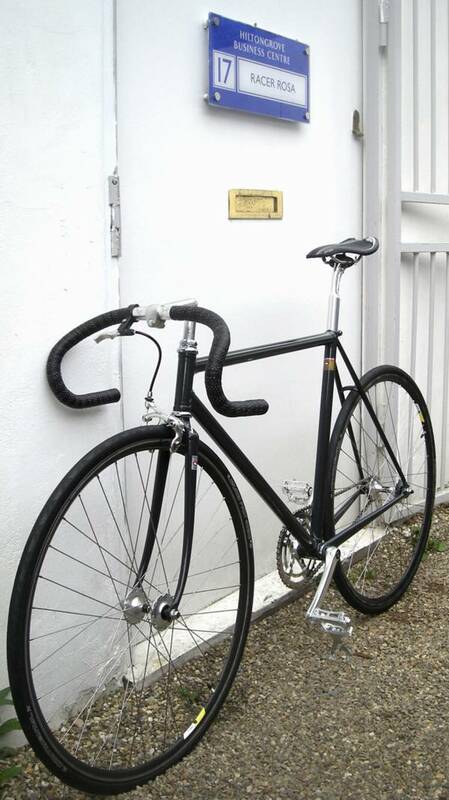 I have a lot of love for your website, for me it’s the Sheldon Brown of the Fixed Gear/Single Speed World. You pretty much single handedly taught & kitted out my first build. My next build will soon-ish be a bike polo bike & a Chopper/beach cruiser. Giles (Buckinghamshire, UK). Just to let you know my chainring arrived in good time. It's a beautiful object too and I'm very pleased with it. Richard (Vale of Glamorgan, UK). I've only just found your brilliant website, I used to buy stuff from ebay and other bike specialists, but I've found your company to be great stuff. I started building my own bikes about 5 years ago and I need a lot of old and vintage stuff for my projects, especially for singlespeed and fixed components. Your stock is really well priced with a lot of different options. The fact that you take such care and customers needs is quite rare. Give yourself a slap on the back for that! Howard (Nottinghamshire, UK). Many thanks, order just received, I am completing a project to build a bike for the local trails in Notts and Derbys. I really like the website, as an old rider (65) the site is a change from the usual stuff. John (Nottinghamshire, UK). Goods arrived today, what fantastic service. Best wishes to all. James (Surrey, UK). Pedals received. Quality service mate. I'll certainly be recommending you. Hideaki (Gunma, Japan). Arrived today, good item. Super fast shipping thank you. Andy (West Midlands, UK). My stuff arrived a couple days ago, very very happy with everything, products are lovely, service was great, thank you very much indeed. Christine (Merseyside, UK). Just want to say thank you for your efficient service as always and is the reason why we always use you! The service you provide is always excellent. Thanks again. Benjami (Oulu, Finland). Just dropping in to let you know that I received my order last week. Super happy with the products and very impressed with your customer service! Maurice (Conwy, UK). Order delivered today! Many thanks for such a slick service. I have wanted a headset wrench for some time and this one certainly looks the business. Chris (Nottinghamshire, UK). Appreciate your quick delivery and great products, I always pass your name on to all my cycling friends, more and more of them are being converted to the joys of singlespeeds! Amy (Hertfordshire, UK). Just wanted to say excellent customer service and super fast delivery. David (Leicestershire, UK). I'm a 'roadie' who is just building his first fixie and have to say, your web site has been great for sussing out how to go about it. Cheers and thanks again. Michael (Oxfordshire, UK). Very impressed with your 135mm customised Shimano hub on my new winter commuting bike, based on a Surly 1x1 frame. Your solution seems much more satisfactory than traditional threaded fixed and freewheel cogs which I have briefly used in the past. Chainline adjustment, for example is much more intuitive. As a result of this good experience I'm building a bomb proof summer training fixie based on a Surly Steamroller with the contents of this order. Matthew (East Yorkshire, UK). I just thought I would let you know I have finally finished my porteur build and I have got round to taking some pictures of it. I purchased several bits from you for the build which saved me a lot of time. Once again, I just wanted to say a massive thanks for all your time and advice, I really appreciate it! Paul (West Yorkshire, UK). Got to say - top draw! Two orders and two refunds for combined shipping. It's not the amount it's the principle which will make me buy any stuff I need in the future from you. Olivier (Berchem, Belgium). Hi there lovely people, I already received my order two days later. Amazing stuff and amazing service. It's a real joy shopping at VeloSolo Bikes! Richard (Birmingham, UK). Just thought I'd write to say thanks for your amazingly quick service. My last order I placed on Friday and it arrived on Saturday morning, I don't think I've ever had such a rapid response from anyone before. I'd also like to say I'm really impressed with the quality of the parts, the Zenith stem in particular looks wonderful, I will definitely be ordering from you again. Anthony (Nottinghamsire, UK). Just a note to say thank you for your great service on my recent purchase. The bars and stem look really good together and hopefully even better when I put them on my Mercian, when I get it back from back from renovation. Once again thank you. Iain (Wellington New Zealand). Just to let you know, I received my parcel this morning and it was all good. Thanks for the great service and getting it sent over so quick, it's much appreciated. Gert (Kessel-Lo, Belgium). Very happy to find a parcel sitting on my desk this morning. You kids are faster and cheaper than shops that are IN belgium. Thanks. Gergo (Budapest, Hungary). I got the envelope today with the chainring and the bolts. Super fast! :) The chainring looks awesome!!! I love the design and the overall feel of the material. Grigory (Orsk, Russia). Thank you for quick shipment. You have an interesting shop with a detailed description of parts and more photos of your products unlike other stores where everything is a photo. Azeem (Hertfordshire, UK). Thank you for sending out my order so promptly. The products are fantastic and compliment my Globe Roll One well. Great service. Bruno (Heidelberg, Germany). Stuff has arrived & will be installed tomorrow. Thanks again for perfect service. Jon (West Midlands, UK).I love your website and products. The website is a wealth of excellent info and super easy to use all of which make the purchasing selection process informed and easy, and the products and packaging are all beautiful and brilliantly functional. Nice. Very nice. An impressive brand. Mike (Hertfordshire, UK). Once again great service and what an excellent part [Kalin stem] - it's transformed an old Dawes Galaxy into an extremely comfortable and practical commuter 30 miles daily. Simon (Suffolk, UK). Again excellent service – many thanks guys. The parts arrived on Friday so with your help I built the bike on Sat morning. The multiple view photos on your site and the technical details you give are the best I’ve found online. Shariff (London, UK). I just wanted to let you know that the goods have been received. Brilliant service and nice parts too! Will be a nice addition my new single speed. Scott (Cambridgeshire, UK). Once again, thanks for the excellent service and top quality products. I wish everyone on the internet were as honourable you. Total pleasure to deal with you guys. Pete (Staffordshire, UK). Had the parts arrive today, great quality, great packaging and a breeze to fit. Very good website with plenty of info covering all queries. Absolutely love the chainring, top notch. Could not be happier. Martin (Yorkshire, UK) This is my first go at singlespeed so I can’t wait to finish my On-One Inbred build. I would like to say the service I get from you is excellent and I think the standard of engineering on your products is outstanding for the price. David (West Sussex, UK). Nice products and arrived the next morning. Thanks very much, I will definitely use VeloSolo again. Jim (Cardiff, UK). Everything arrived this morning - exactly as ordered, beautifully packaged, and just a day after placing the order. Fantastic. Thanks. Daniel (London, UK). Hi there. Just a quick email to say you guys are amazing. Best customer service I've ever had. Gavin (South Yorkshire, UK). So fast with your dispatches and your website is brilliantly comprehensive. Andrew (Somerset, UK). Please find attached photo of my bike now wearing the chain and SS spacers ordered from you guys. I would just like to let you know in these times of **** poor service you stand out from the crowd! Fredrik (Turku, Finland). Just have to say thanks for the excellent service once again. Quality store, good products, easy payment, well packed, and ûberfast delivery to Finland. My mailman dropped off my stuff today! Looking forward to shopping with you again! Mark (London, UK). Just a quick note to let you know I'm very happy with my new chainring. Speedy delivery, excellent quality and finish of product and really good value for money. I'll definitely recommend these products to my friends! Mike (Hertfordshire, UK). Goods arrived Thursday - what a terriffic buy - £13 and it has totally transformed my built up old Muddy Fox Courier (frame purchase £25 on eBay) into the most comfortable machine I've ever ridden - an absolute joy to ride. Many thanks for a great service. Oscar (London, UK). Hi, just received the hub spacers this morning that I ordered yesterday, just wanted to let you know how pleased I am with the service, it is rare these days that I am impressed by a company's service, not only do you have all the best stuff but it's delivered like lightning, I will be back soon. Sander (Mechelen, Belgium). Thanks for the swift delivery, and the great product. I will shop with you guys again and recommend you to fellow riders! Scott (Cambridgeshire, UK). Just wanted to drop a quick line to say thanks for the latest order. That's the second lot I've had off you and remain very impressed, both by the quality of your produce and the service you provide. I think your business ethos is to be applauded in these current times of "anything for a quick buck" and I will most certainly be back to deal with you again. Once again, thanks for your speedy resolution to my orders and congrats on the superb quality of your goods. Grant (South Lanarkshire, UK). Just an email to commend you on your excellent service and despatch time. Very pleased with my new Track Tool also. Brendan (West Yorkshire, UK). Hello VeloSolo. I have just received the order that I placed 24 hours ago,and I have to say how excellent you are, probably the best cycle parts supplier that I have bought from. Phil (West Midlands, UK). Just wanted to thank you guys for amazing quick delivery! Thanks again guys! Will defo use you again! Vesa (Helsinki, Finland). Got my stuff today! Many thanks for fast delivery. Golden cog looks super nice! Christian (London, UK). Thanks a lot for the cog! It arrived really quickly! Really good quality, amazing for doing tricks :) Thanks again! Lucas (Ostergotland, Sweden). Got my package today and I am very happy with the products! The Squeeze bar looks and feels fantastic on my city singlespeed. Jonathan (Singapore). I received the chainring this week. Just thought I'd drop a note to tell you how much I appreciate the quality of your service and the product. The ring is indeed machined to a very high standard and looks great on the FSA crankset I've installed it on. Many thanks and you can be sure I'll be back. Jon (Shropshire, UK). Made my first purchase from you over the weekend – ordered on-line, goods delivered today. The right goods at a very acceptable price, delivered within forty eight hours – and I thought the little hand written note on the invoice was a particularly nice touch! So, just wanted to say thank you, great service and very much appreciated. Thomas (Denmark). I received the parts yesterday and WOW, that's like SUPER fast! Very nice! The parts are just as expected too - very nice! Thank you very much. You have another future customer! Tim (Queensland, Australia). Just a quick note to let you know the order's arrived and how pleased I am with everything. The finish on the handlebars is awesome, and the bolt on cog is the duck's nuts. David (London, UK). Just wanted to drop you a note saying how impressed I am with the service I received, full marks to you guys. Love the back wheel VeloSolo logo design by the way, looks awesome! Wilhelm (Uppland, Sweden). Big thanks for an awesome shop and great custom service! I'll definitely be back in here and recommend you! Jon (Essex, UK). Just to say a big 'thank you' for your delivery which was waiting for me when I arrived home from work this evening. All I can say is that your standards must be even higher than mine as the chainring looks fantastic, despite being a 'second' and was a complete bargain. Thanks for your great service, quality products and attention to detail. There's a lot of very average service from other companies, in comparison! Joseph (London, UK). Just a quick note to say how impressed I was with your service. The Oury grips I ordered were delivered so quickly, it is by far the best service I have experienced online, so thank you very much! Konrad (London, UK). Thanks for the items you sent - they got here on time, perfectly packaged, and are delightful products that should look ace on my new build! David (South Yorkshire, UK). Extremely impressed with the service, only ordered yesterday morning, goods have turned up at work this morning, with a very efficient accounting process to boot. Items purchased look top quality, at a very good price. I shall definitely be back. Eduards (Riga, Latvia). Yesterday received goods. Thanks for fast shipping. I'm very satisfied with service and quality of received components. Definitely will shop in VeloSolo again and recommend your shop to other fixed gear enthusiasts in Riga, Latvia. Phil (Hampshire, UK). Just wanted to say that it is very refreshing to receive the level of service and customer care VeloSolo Bikes have provided. I shall recommend your shop to all I know. Miika (Aarhus N, Denmark). The [VeloSolo] chainring feels and looks like a high quality product. It seems to run very smoothly, and also allows me to run the chain with a bit more tension than before due to the great improvement in roundness compared to my old chainring. The black anodization also looks very good in my opinion. Based on my first impressions I am very happy with the product! Finally, thank you for the great customer service. I have bought bike parts and accessories from many different online stores, and can honestly say that the service at VeloSolo has been the best I've experienced. Tim (New South Wales, Australia). Hi, just wanted to say thanks for the super-efficient delivery to the other side of the world. The VeloSolo system is making it possible for me to create the ultimate hybrid bike, which, if you're interested, I'm blogging about here. Thanks a ton! Heikki (Riistavesi, Finland). Assembling a bike is a lot of fun but there's so many little things to remember and due to the lack of proper parts here in Eastern Finland I pretty much have to order everything online. It's a great thing that you guys provide this good range of quality products! Plus the service is excellent! Thanks again! Dale (London, UK). I received the chain yesterday - fitted it last night. I am extremely happy with the choice of product and the service level of VeloSolo. I shall make VeloSolo first choice where possible for my cycling purchases in future. Alan (Perthshire, UK). My goods arrived on Saturday morning and some are fitted and have been ridden as I type. The products are superb and super quick service. Sveinung (Corconne, France). Well pleased with pedals and Restrap pedal straps: both look amazing (especially like the new Restrap logo) and work well. Very pleased with your shipping as well, really with the entire shopping experience. I'm on a geared bike (90s Giant steel bike on French country roads), but found much to drool over at your shop. Will come again. Drew (Minnesota, USA). Hi there, here's what your fixed cog allowed me to do: futzed with the chainline of an Eccentric Eno hub to match up with the 56mm chain line of a 83mm BB Hammerschmidt: link. Thanks a ton! Johan (Fabio, Brazil). I already have a VeloSolo cog on my fixie but it´s too small and cycling through Sao Paulo (which has many hills and always big distances) is hard. So, I decided to buy another one, a little bigger, to make my life easier. What I want to say about your product is that is simply perfect! The one I have is a steel one and now I bought an aluminium one to check the results. I have no doubt will be perfect too. Also I would like to say that your website is fantastic with very clear instuctions for buyers and bikers. I am more than happy with VeloSolo products and recommend them to everyone! Diego (Racer Rosa Bicycles, London, UK). I thought you would be pleased to see a few snaps of our latest project, just collected this morning by a happy client. It shows your VeloSolo chainring fitted together with big sounding components, i.e. a columbus steel made to measure frameset, campagnolo rims and front brake, Miche hubs and crankset etc. Hope you enjoy to be (deservedly) matched to other quality and famous brands! The client was particularly pleased with the look of your chainring, which matched perfectly a lugged classic frame. Racer Rosa Bicycles. Jamie (Leicestershire, UK). Would just like to thank you guys for the fantastic service you provide. It's good to see you take the time to take multiple photos of your products before you put them on your tidy website. I'm a mountain biker traditionally so am new to all things singlespeed and I'm grateful for the useful advice you give so I can get my custom built road bike ready for the summer. Ruben (Darmstadt, Germany). I am so happy. I needed the 15t [Disc Cog] so much because I'm going to run a 37t sprocket, so at least I want a gear about 2.5. The chrome is how I expected from the pics, very good. If the finish would be better before chroming, Phil Wood`s would not be nicer. It is great what you offer for that price! Thanks a lot! Johan (Linköping, Sweden). Hi guys, I just wanted to express my thanks. Great products and great service! Matthew (Cambridgeshire, UK). I just got home from work to find the parts I ordered yesterday waiting for me. What an awesome surprise. So I just wanted to say thanks, your service is amazing. Keep doing what you're doing! Mike (Isle of Man, UK). Just a quick note to say thanks for your prompt service, received my order this morning, fitted them this afternoon and tried them in anger tonight! You guys should be very proud of the quality service and products that you supply. Once again many thanks. Jim (South Yorks, UK). A pleasure dealing with VeloSolo for the first time and I'll not hesitate to do so again in the future, and will also recommend you to associates. The item I purchased was half the price of many of your competitors, and more so arrived with a hand signed receipt, something that does not happen very often when buying over the net and goes a long way towards customer loyalty. Chris (Hampshire, UK). Thanks for the sprocket [Disc Cog], thought you might like an early update. Have ridden this twice now and what a blast. 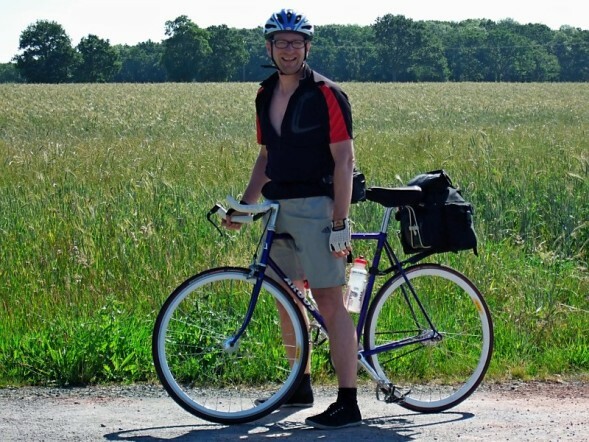 I ride single and fixie (road/MTB) and have done for many years. This is a new experience off road. I ride a Trek 69er and it is brill as a SS but with this it's even better. You get great feedback through the rear (like my fixie road) and with some forward planning on single track wheelies & bunny hops are fun. Totally recommend this to any solo rider. Doug (Victoria, Australia). I received my chainring today, and am absolutely stoked with it. Just thought I'd send you an email to thank you for your service, product, and the personalised hand-written "thanks" on my invoice. Cameron (California, USA). A month ago I put my new fixed gear together. I am a heavy guy and I beat the cr*p out of hubs. I have busted and stripped so many rear hubs and threads on cogs that it was costing me at least a cog and hub every three months. Your cog and Shimano hub conversion was a last ditch effort for me. The setup is bullet proof. I have been riding my bike harder than I ever have. It's because of your cogs and technical information that you're willing to share that I can continue do what I love. Ondrej (London, UK). Thanks for purchase [chainring], I am already riding and it is perfect. It was a pleasure to shop in your e-shop (really fast shipping and great communication), I must recommend you to all my friends. Simon (London, UK). Just wanted to let you know what a lovely bit of kit your chainring is (46t/130 BCD). Very round indeed, quiet and solid – nice job! Steve (West Sussex, UK). Thank you for sorting the above [order] so quickly. I'm especially pleased with the Trixie tool, which is far superior to the Park SS1 that it replaces (how often can you say that about Park tools?). VeloSolo will certainly be the first place that I come to for fixed bits & pieces from now on. Tony (Dorset, UK). Just a quick note to thank you for getting my Andel cranks to me so quickly. I'm delighted with the quality. It takes me back to the good old days when Campag Record cranks were reasonably cheap! Thanks again for looking after me so well. Nicholas (Oregon, USA). I received the cog yesterday afternoon! Thank you so, so much! Immediately after receiving it, I installed it to my 26" rigid beater/townie/polo bike and went for a little off road ride (our local trails are really timid, so this was just a little intro). Later that evening, nearing midnight, after finishing an offroad club ride, I put my winter MTB (SS rigid 29er) in my car, grabbed my second battery and went out for my first, real scorch. Fixing offroad was instantly addicting. I woke up really early this morning and rode another four hours off road on the bike on some real trails and am really loving it. Thank you so much for the enjoyable product! Gerald (Windsbach, Germany). Thanks a lot for the quick delivery. I've seen the chainrings on your website and I fall in love. After opening the cover my eyes get big and I couldn't close my mouth. The chainring is the perfect one for my new 29er singlespeed. And it looks great with my Hope Pro II singlespeed hub in gold. Great parts from UK! Big thanks from Germany. Philip (Newcastle Upon Tyne, UK). Hi, just thought I'd drop you a line to say thanks for another brilliant purchase from you guys. Came within 24 hours of ordering, how online shopping should be! I also got my first VeloSolo product, a 46t chainring. Have to say I'm impressed, it's lighter than my last 'ring and seems really straight and round so far! Johan (Gustavsberg, Sweden). Your stuff is simply awesome! I have now, with the help of the stuff you sent me, managed to save my beloved early 90s Miyata MTB from the abuse done by my LBS, and turned it into a proper single speed! I was simply amazed that I today was able to pickup the stuff I ordered Sunday. Great service! I could not be happier! I am now looking for a suitable old bike to convert to a fixie, and I will most certainly be ordering parts from you as soon as I find one! Rafael (Las Palmas, Spain). Everything arrived in perfect condition. Thanks for such an excellent service and prompt response to inquiries. Yehuda (Israel). The goods arrived here at our village post office yesterday. The items look really good. I must say that you have a winning combination of service, quality and charm. Wayne (London, UK). Hi, many thanks to all at VeloSolo for an excellent service, very quick reply to emails and a very swift delivery despite me ordering the item over the bank holiday. Stephane (London, UK). Over the last few weeks, I have purchased quite a few parts for my new fixie project. I wanted to let you know that the service you provide is really of great quality. 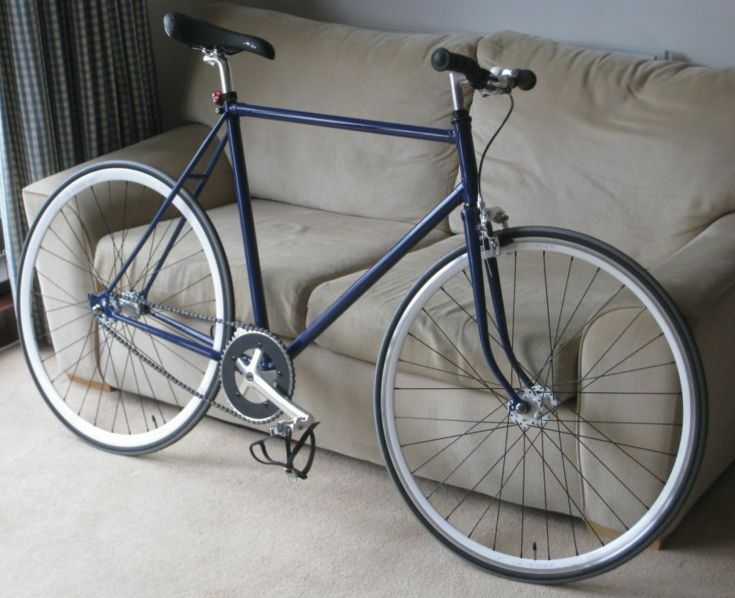 I have attached a picture of the bike which includes all the items I have purchased with you. I am really pleased with the result. Mike (Staffordshire, UK). Thank you very much for my second delivery in a week. I am mightily impressed by your website and your quality of communication and speed of delivery. I am relatively new to fixed/single speed and your FAQs have been invaluable. Paolo (Milan, Italy). Thank you very much as usual for your excellent service and communications. The goods are, as I imagined, awesome! Jackson (Sussex, UK). Hi, just to let you know I received these items this morning and everything's fine. Both my recent purchases from you have been dealt with amazingly quickly and your communication is second to none. Nice to do business with you, all the best. David (Chaumont, France). Hello VeloSolo staff!! I want to say you a big THANKS!!! I've ordered my chainring Monday and I have received it Wednesday...crazy! And today it's on my bike to snowy going to work! Jerome (Bordeaux, France). Just got my order today, 3 working days between shipping and delivery. The VS Pre-Cut handlebar is even more beautiful than I expected. Couldn't be more pleased. Maciek (Wroclaw, Poland). Today I've received the package. I wasn't expecting it so fast. Many, many thanks. This VS riser is just perfect with the Nitto stem and Oury grips. Stefan (London, UK). I would just like to take this opportunity to say thank you for such courteous and efficient service. After being dealt with so disgracefully by another ebay bike company today it is a real breath of fresh air to buy from you. I look forward to receiving my product and working with you again. Your reputation is clearly deserved. John (Dunbartonshire, UK). Thanks again for such excellent service and high quality products. You have put my faith back into buying from cycle shops online. I know where I will be ordering from now on. Oliver (Leipzig, Germany). The parts have arrived and I just want to say thank you for the fast delivery, the nice packaging and the excellent quality of the goods! It was a pleasure to do business with you guys! Mark (County Dublin, Ireland). Just a quick mail to say I've just received the axle and ss cog. Fitted them tonight with no probs and whilst I was there I flopped the disc cog I've been running for the last year or so. Absolutely no visible wear on the teeth so looks like it should be good for a while! Thanks for a great product and great service. Josh (London, UK). Hey guys, your track cog and Dura Ace lockring arrived today, they are so nice! Cog is really light and went on really smoothly. I will defo be buying more from you in future, keep up the good work! Kevin (Leicestershire, UK). Hi, just a quick note to say how pleased I am with your your service & products. If I need any more parts or advice, which I'm sure I will, you`ll be my first port of call. Thanks once again. Rosario (Ferarra, Italy). Hi everybody at VeloSolo, finally I assembled all components and tested a little the bike. It works really well! Thanks a lot for the support, as a newby in fixed bikes I really appreciate your feedback. Felix (Dülmen, Germany). Hey, I wanted to say thank you for help, your products and fast delivery. Yesterday I finished my bike and it rides perfect! Looking forward to the next bike and the next orders here. Zsolt (Budapest, Hungary). I got the goods today and am really satisfied. I very much appreciate all the help and care. Sergio (Burgos, Spain). Hello VeloSolo. I received your package yesterday, wow, how fast! The cog is perfect and I will use as soon as i can. Thank you very much for everything. Erwan (Fougères, France). Hello. It's been a pleasure dealing with you, thanks for all the quality parts, fast delivery and honesty on the shipping charges. The parts you have been delivering all fit nicely, and as expected. Edouard (Paris, France). Hi, received the package as fast as the other time, 2 days! Perfect service and quality of products... will come back :) Thx. Phillip (Amsterdam, Holland). Just want to say a big thank you for the fantastic business and service that you offer. All the parts arrived very quickly and the bike will be shortly finished when the back wheel has been built. Many thanks and until the next purchase. Peter (Budapest, Hungary). It's amazing how fast you are! I ordered on Sunday and use it on Wednesday! Thanx a lot. Steven (New South Wales, Australia). Hi, got the parts in record time. This is the second time I've bought from you and the service has been outstanding both times. You've made a loyal customer - keep up the good work !!! Bjorn (Stockholm, Sweden). Hi! Just received my chainring and last week I got my chain and tools, just 3 days after I placed the order. That was the quickest international shipping I've seen! Thank you very much for great service. Alexandre (Franconville, France). Thank you warmly for being so efficient in sending me the artefact ordered on your online shop. Emails were sent without delay and the parcel packed before paying the excess postage to Europe. I'm very happy with the product I received. Simple design solution for the fixed cog amateurs. Simon (Hampshire, UK). Thanks for the quick service. I only stumbled onto your website by chance yesterday morning and bought the sprocket with a small hope of it arriving in time for a TT tonight. Well, it arrived with this mornings post and is already on the bike. Thanks again. Steve (Warwickshire, UK). Hello VeloSolo, just a quick thank you - I received everything ordered the next morning all perfect. Rarely is online ordering so successful. Happy customer. Regards Steve. Percy (Berlin, Germany). Today my order arrived and I'm very happy! Coolest Bike- Parts, thanx!! Greetz from Berlin. Derek (Surrey, UK). Just got the clips, straps and spanner I ordered on Sunday night today. Put them onto my new Charge Plug at once and they are awesome! Just wanted to say thank you for the speedy service and the great customer service. Mathies (København N, Denmark). To thank you for the nice items and as important the fast + cheap shipping and very good service. Justin (Michigan, USA). The cog is a beautiful piece of machining. It looks like jewelry. Cheers and thanks again. Stephane (Lyon, France). Hi, I receive the Nitto stem today, very beautiful piece of design and very quick shipping! I had put it on my bike ( Alan Super Record 1982 ss) and ride all the afternoon in the city...wahoo! Thank you very much, I'll come back in your store. Best regards from France. Colin (Glasgow, UK). My package arrived today and those squeeze bars look better than I could have imagined! Thanks again for your help. Mark (Middlesex, UK). It's been a real pleasure doing business with you and VeloSolo - great service and lovely kit. Pippa (Hampshire, UK). Got my order today, super fast service, great! Will recommend and use VeloSolo again! Klas (Gothenburg, Sweden). Thanks for all the help. Your service is on top of the game, nothing I've ever encountered before. Top. Alejandro (Barcelona, Spain). Everything arrived last thursday. I already installed it and I am very pleased with your products. Thank you very much for the excellent service. Mike (PA, USA). I received my order a few weeks ago thanks for everything. The bike is complete and I couldn't be more pleased with the drivetrain. Tony (London, UK). Polished hub (and cog) just arrived in the post. The hub looks fantastic! Ville (Hellsinki, Finland). I'm very pleased with the hub, It looks great and fits the bike nicely. Can't wait to build the wheel and start riding. Kay (Hamburg, Germany). The items awaited me coming home from work yesterday. What a fast and smooth transaction. Thank You. Joakim (Lidköping, Sweden). I'd just like to show the bike I've been riding for a month or so now! I had fun building the wheels - the first two I've ever built actually (they're still true, yay)! Anyway, thanks again! I'm really satisfied with the setup. It's so nice to ride a silent bike! Patrick (Surrey, UK). I've received the hub .. thank you .. it looks fantastic! That's a great job .. I think it's too nice to use!! Anyway, thanks very much for the swift delivery and the great job. Rinus (Eemnes, Holland). Sorry I didn't get back to you sooner, but when your stuff arrived I started lacing my wheel right away. Everything arrived in perfect order, and I must say, due to your excellent service you put internet sales back on my map! The stuff looks excellent and it works just like you guys promised. The pefect set up for my left hand drive fixie! Adam (Budapest, Hungary). I just wanted to drop a line to inform you the package arrived and to tell you I'm absolutely stunned by the quality of the items. I'll gladly share my experiences once I finish the wheelbuild. Thank you for the lightning fast delivery and keep up with the good work! Ted (California, USA). I just wanted to let you guys know I received the package last night. It got here much quicker than I expected. Thanks for all the help and getting everything as quickly as you did. Grady (Stuttgart, Germany). Thanks for the extra effort for a small sale. Matthias (Koln, Germany). Many thanks for the refund and the fast shipping, I received the package already last week. I converted my hub yesterday without any problems. I'm really convinced by your principle connecting cog and hub and I recommended your products to some friends. Liam (Somerset, UK). This item [Zenith threadless BB] is brilliant and has saved my 70's hand built Argos. Glen (Hampshire, UK). Just a quick note to say I received my order today and it looks absolutely fantastic, great traction on the chain so it works really well. Fast delivery and superb customer service, made in the UK as well - couldn't ask for more. Aidan (London, UK). I'm really happy with your products! One of those chainrings is bound for the Singular Puffin snow bike which I'll be adventuring around Iceland on this year. The other is for my regular MTB which I'll be racing in the UK. Great stuff! Rob (Cumbria, UK). The 15mm track nut spanner is a work of art! It's almost too nice to use. It's perfect for taking out, big enough to get good leverage/torque but not too heavy for the jersey pocket (or saddlebag). I'm looking forward to fitting your sprocket. If they are as well made and as nice looking as the spanner I'm sure I'll be buying more stuff to go on my new fixed wheel bike. Tim (Norfolk, UK). Thanks for the chain, I know you get things off very promptly and in this case Royal Mail have also done the biz, 19 hours from order to delivery, could be a record! James (Victoria, Australia). Just wanted to thank you again for your prompt service and to let you know I received the delivery today. Very happy with the overall service and will be shopping with you again. © VeloSolo Ltd ® 2019.